Dot Net development forms the backbone of web development across the globe despite the introduction of several technologies in the recent times. A lot of businesses choose to build .NET applications to cater to their unique requirements. Microsoft .NET is one such framework that helps in developing reliable and scalable applications for web, desktop and mobile platforms. But to get the most relevant .NET solution that fits in your shoes right and delivers a high return on investment, you need to hire ASP.NET developers delivering perfectly tailored solutions. 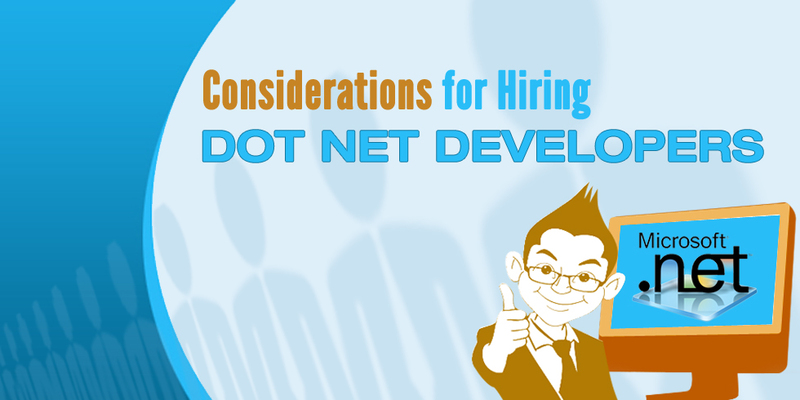 To help you find a reliable .NET development partner for your company, we have listed down 5 important considerations. So here we go……!! The soundness of a company is to be taken into consideration before selecting any software development company. It is important to determine how the company has been doing, its progress and since how long it has been operating in the market. Lay stress on longevity of the company. Consider the brand image of the company in the market. Companies being in existence since a long period of time have experience in delivering desirable results and sustaining a long lasting relationship with their customers. Verify the quality of work delivered by the company in the past. You can have a look at the testimonials and even contact the clients for feedback to get an idea of the quality of the .NET applications built by the company. Choose companies that are CMMi certified or have ISO 9001 certification to get high-quality .NET applications. The amount of experience of developers is equally important to consider. Developers should have the requisite technical skills and expertise to work on .NET projects. The development team should have rich experience in creating applications from the scratch to migrating legacy applications to the current .NET platform. The programmers should have expertise in various Microsoft technologies, such as ASP.NET, C#, VB.NET, MVC and more. Developers should even have hands-on experience in working on Microsoft SQL Server, Windows Azure, SharePoint and more to develop, deploy and maintain web apps and services. Many organizations require integration with their existing systems, making it vital for developers to have experience in solving interoperability and integration issues. Ensure that the company you are hiring can cater to your bespoke needs whenever required. The developers should have the capabilities to customize .NET solutions and integrate with various modules, plug-ins and mobile OS. One of the most important factors for choosing .NET developers is the pricing and hiring models. Most of the professional .NET development companies have various hiring models to give different options to the clients. There are various pricing options depending on the hiring models. The company should allow choosing the one that suits your specific business requirements. Compare the aggregate cost of development and select the one that works well within your budget without having to compromise with the quality and time. It is important for you to determine the level of support provided by the .NET development company, post deployment. Ensure that you get assistance from the support team 24/7 to avoid getting stuck in between at any point in time. The team should be providing prompt resolutions to your issues and queries and assuring seamless support. It is best to evaluate your development partner based on research, facts and figures rather than hiring them without prior inquiries. We hope the above points will help you in finding the right .NET development partner, catering to your precise business needs and helping add value to your business. Semaphore Software is a renowned .NET software development company, delivering high-quality, and robust .NET applications to various industry verticals. Contact us through info@semaphore-software.com to connect to our highly-skilled and experienced ASP.NET developers!